We at St. Mark’s have been blessed with some beautiful new paraments for the altar. The problem with new articles made “for holy use” is that there are old articles made for the same purpose. You are caught in the bind of thinking a) we didn’t find them “good enough” for our use so why would we expect someone else to use them and b) they don’t really belong in places of common use after being on the altar for decades. So what happens is that you store them waiting for that opportunity to use them or gift them. That opportunity came along for us. One of the sons of a family at St. Mark’s is part of an Anglican Ordinariate church just getting started. While we would have been very happy to have his family here at St. Mark’s, we are a Lutheran Church that believes, teaches and confesses according to the Book of Concord. That was not where this son was at. 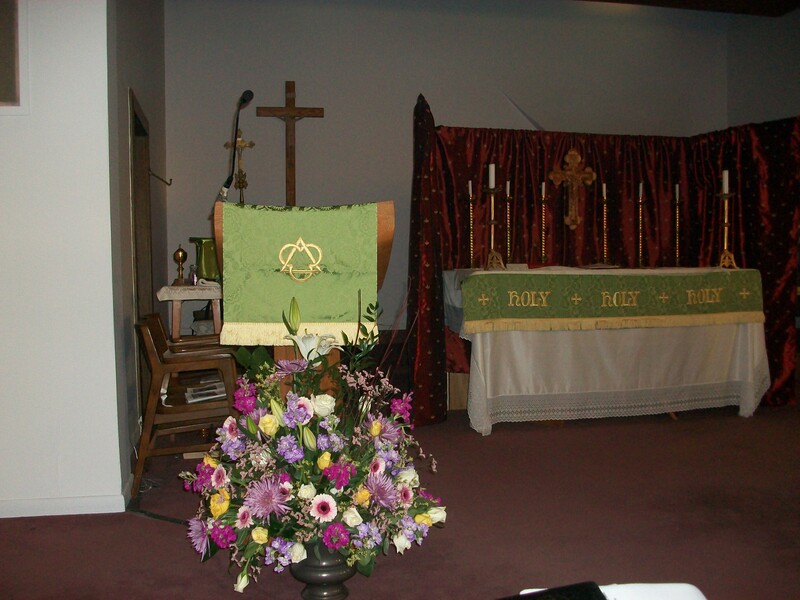 One of the to-do’s about starting a “high church” congregation is dressing the altar. Knowing that we had some in reserve so to speak, his mom asked if they might be available. The rest is history. 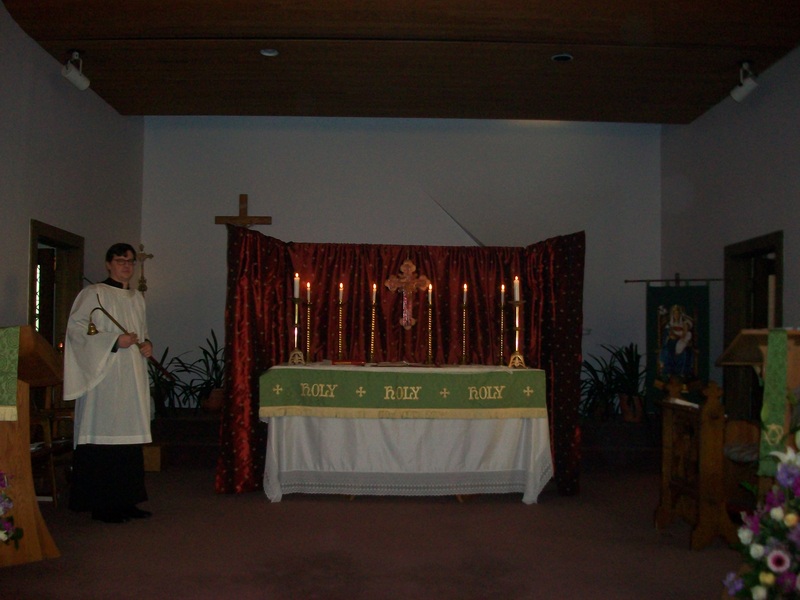 Here are some pictures of St. Mark’s old paraments being put to holy use in a new home. Here is something that I’ve found to be true of any orthodox body I’ve ever been around. First, they are not shy about saying what they actually believe. They believe it because they have received it as from the Lord. Second, they will invite your to “come and see” or journey along to see that truth. They do that largely because they themselves are on such a journey. We are all sinners and have fallen short of the glory of God. Third, because they know who they are, they are able to truly interact in love with others. It is not a false love that is constantly just desiring approval from the other, but a love that bears all things (1 Cor 13:7). Even a separation when there is no longer a true communion. Eventually we will be able to see clearly. 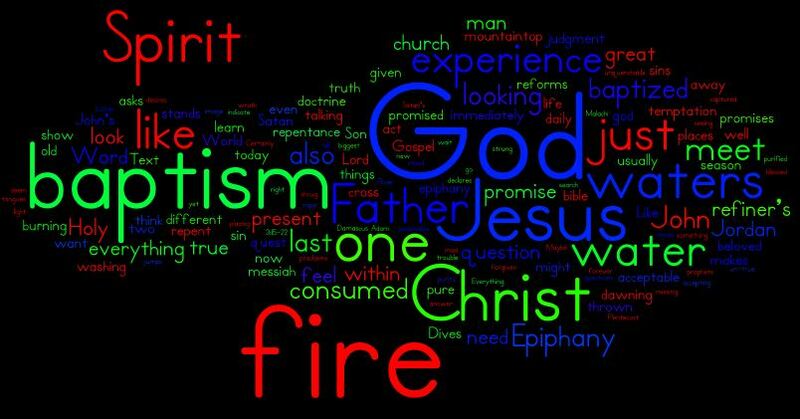 Following the season of Epiphany texts we’ve been looking at the ways that God reveals himself. We’ve structured it around what I’ve asserted is the question of the age: How do we see/meet God? Our culture and even many of our churches have attempted to claim or put forward an unmediated experience of God. And if we don’t have that direct access, then we turn away or search in another spot. The biggest problem with that is that God has promised to work, to be present, through means. The grace of God comes to us through the means of grace. The last couple of weeks were baptism and the Lord’s supper. This week was first confession and absolution. Those are the proclaimed word reduced down to their essence. Today, in your hearing, is the year of the Lord’s favor. The eternal Jubilee has been proclaimed by Jesus and the church has been proclaiming that release ever since. The second slowly dawning epiphany that this should point toward is the false spirit nature of any movement or group that says you don’t need a church or a congregation. Because the church is the focus of those means. 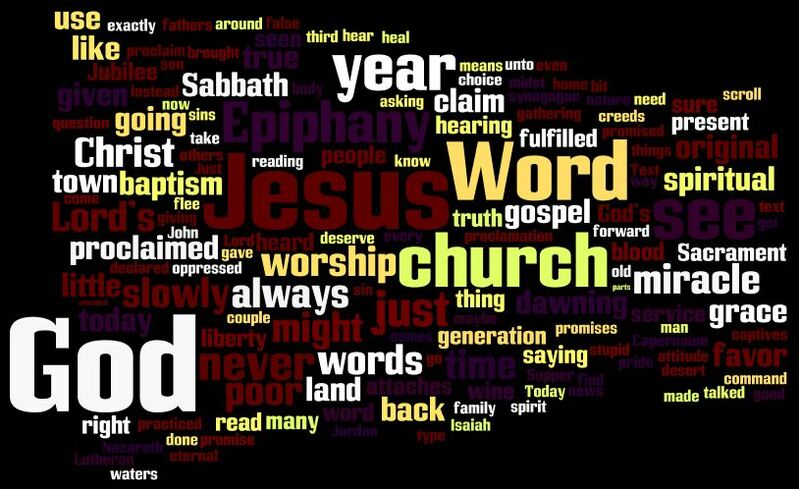 Where ever two or three are gathered, or as the text for this sermon says, it was Jesus’ custom to go to church on the sabbath. That is an anachronistic claim, the real word is synagogue, but it stands as the text shows the basic structure of that OT service. The synagogue was brought together around the word – written and proclaimed. The OT sacramental word was found in the temple. We are the inheritors of Word and Sacrament. God has always primarily worked through Word and Sacrament. It has always been grace, through means. Those means following Christ are found in what we call a church. This is Ross Douthat starting with the March for Life, but quickly getting deeply wise and insightful real fast. For its part, if the pro-life movement wants not only to endure but to triumph, then it needs an answer to this argument. That means something more than just a defense of a universal right to life. It means a realist’s explanation of how, in policy and culture, the feminist revolution could be reformed without being repealed. He’s right, and this is a call from a practicing Roman Catholic to recognize a couple of things about civil society. However much ongoing harm the sexual revolution has done, repealing it in civil society is not possible, and some portions of it none of us would want to repeal (I’m thinking the equal pay portions and the access to occupations). As Mr. Douthat starts his column, the heroic generation of this cause is passing away. Heroic generations are revolutionaries or in this case counter-revolutionaries. Our generation is about recognizing the limits of revolution. That doesn’t mean making peace with it, but it does mean being smart and finding the places where life can win and start being seen as legitimate reformers instead of calling for the whole structure to be removed by the axe at the root of the tree. It has been a rough week at the Parson’s household. This is at best an unfinished set of ideas. The only thing I can say in its favor is the invitation to see. In the gospel of John, believing is seeing. What you believe is how you see things. The wedding at Cana is Eucharistic, having to do with the Lord’s supper, it is an invitation to see the reality of Jesus and the Kingdom in, with and under the staples of life – water, bread and wine. As we say after the institution, “welcome to the table of the Lord”. Cana is John’s invitation – the first of the signs – to see the omega, the telos, of where this is heading. The world is a comedy; it ends in a wedding with plenty of choice wine. More than enough. Filled to the rim. Almighty God and gracious Father. Your ways are beyond our understanding. In your hidden wisdom hopes can be turned from joy to grief. In your mercy, revealed to us in you son Jesus, lead us to pray your will be done. And find comfort in your deliverance from the evil one who afflicts us even in our very members. In Christ, the Lord of the living and the dead, we await the final revelation at the resurrection of the dead and the life of the world to come. Amen. This is Scot McKnight pondering the future of Seminary. Here are some fellow LCMS’ers bemoaning something very similar. At MOOC (massive open online course) Divinity School (Mooc-Div), the seminary of the online future, students will work with degree granting organizations (DGOs) to fashion a seminary education without ever stepping foot on a seminary’s campus, if a campus exists, or meeting any of their professors. Given the write up, Scot is not too enthused. The CSPP are not happy either. Let’s just say I’m a little different. There are some sad things about the passing of one form of education, but we have to deal with the world as it is. And dealing with that means dealing with two things as far as I can see: 1) the cost of education for something that most of the church considers at best “nice” and 2) what I think is the big opportunity to really tackle the complete breakdown of trust. Both of these comments assume that this type of thing actually alienates and causes even more hyper-individualism. As far as I’m concerned, in the era of facebook, those are the starting facts. 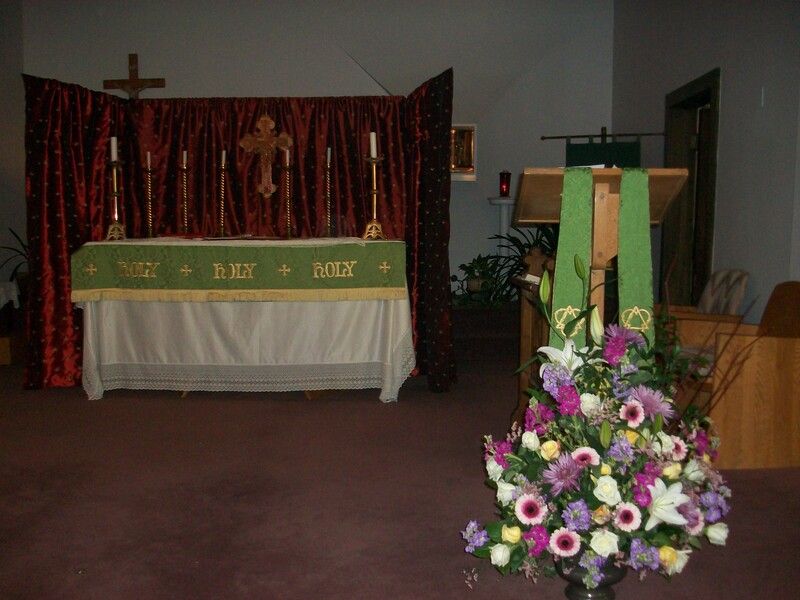 The other item is that I think this might put the focus back on where it should be, the local congregation. The time out of the local congregation would be reduced. And if they were smart the local congregations would use things like this as outreach vehicles. Instead of the prestige and “action” as it were being in going away and being taken out of the congregational context, the congregation becomes the learning community. If I look at history, I think that has been the paradigm in most places. Even at the dawn of the seminary system it was a congregation that “sent their best and brightest” for training expecting them to come back. This would rebuild that trust because the learning is taking place under the congregations nose. Here is the latest Pew Forum poll taken around the 40th anniversary of Roe v. Wade. Let’s set aside the political battles of “overturning Roe v. Wade” as the headline would have it. As important as that might be, the underlying issue is what I’ll call moral imagination. Imagination may not be the right word, but what I mean is simply that ability to recognize wrong when you see it. This poll is interesting to me in what it reveals about that moral imagination. A prerequisite to overturning Roe would seem to be a super-majority of people convinced of the moral atrocity of turning a mother against her child. And I want to be absolutely clear here, this sin in not just personal but societal. The number of and compounding of sins that would lead to an abortion mill and an absolute right up until the 9th month is widespread. The failures are legion. Christians who have open eyes use the starkest stories and examples from the bible for this: Cain and Able and Molech. The poll shows just how weak and divided is this moral imagination. the public continues to be divided over whether it is morally acceptable to have an abortion. Nearly half (47%) say it is morally wrong to have an abortion, while just 13% find this morally acceptable; 27% say this is not a moral issue and 9% volunteer that it depends on the situation. These opinions have changed little since 2006. So 47% recognize the wrong. That part doesn’t say anything about the weight put on that judgment. There is a big gulf between saying Molech and saying, “yeah, that’s wrong”. 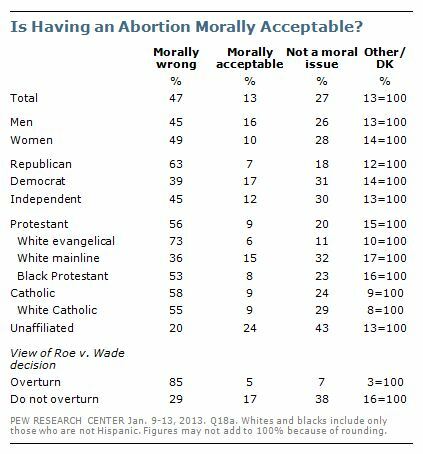 But 13% say “go ahead, no moral problem”, another 27% don’t even admit to abortion being in the moral realm at all. Think about that, over a quarter of the United States says a mom killing her kid is not a moral decision. Another 9% you might say recognizes a moral claim, but it willing to grant space “depending upon the situation”. So at best you could say 56% recognize that there is a valid moral claim to this decision. That is a long way from the 67% that would be necessary to actually achieve societal change. Now lets turn to the strength of that moral imagination. Only 18% of people think of this as a critical issue and that is a declining number, although it might have hit a bottom. 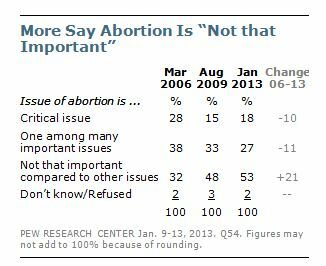 Even if you add the two categories, you only get 45% that will admit to abortion being an important issue. Somewhere along the way 2% of people who know it is a moral judgment just don’t think its important at all. The best you can say is that the moral imagination is not that strong. One last graph on the moral imagination. This one doing with how well various church grouping are doing at teaching or forming that moral intuition. I think that chart makes it pretty clear the absolute moral impoverishment of the “protestant mainline”. Tough words, but they are clearly the group Paul is talking about in Romans 1:32. If you are a Christian who has eyes to see and ears to hear who is residing in one of those churches, now is the time to flee. You have put up the good fight. You have stood your ground even though you did not have much strength (Rev 3:8). The judgment is coming. So, when I look at those numbers, they are not as bad as I could have imagined. There seems to be a significant minority that have eyes to see the moral horror. Added to those are near a majority that if (as Dorothy Day would quote) we were able to make it easier to make the right decision, would make the right decision. But that is at least 1/6th of the populace away from actually being able to make change, and that 1/6th must come from conversion and awakening. And it must come in the face of what can only be described as the false prophet. None of the various interpretations applied strike me as deeply insightful. 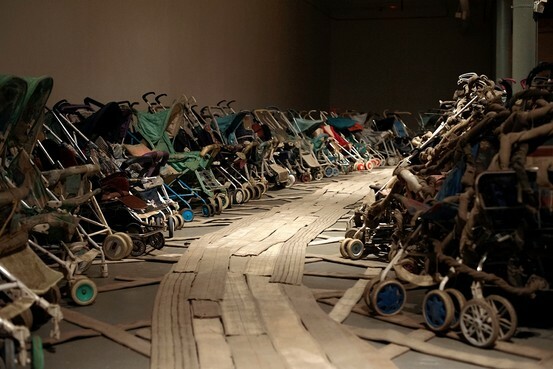 Why would a bunch of abandoned strollers strung together be such a powerful piece of art that it would be moved around the world and 20 years later be reassembled as representative of the best. Why would this move people? I can’t see empty abandoned strollers being “hope for the future” or as it later says when Athens saw it as ” it was much more about history being a kind of monolith, looking at these strollers as evidence of a cultural history that they were involved in in their own life”. What cultural history? Did the people of modern Athens build the Parthenon? Arguably what the people who have seen this have built is empty baby strollers. Empty by means of “crack”. Empty by means of hyper-materialism that said kids are too much trouble, even if they never actively said that. Empty by means of abortion. The ironic twist is Amazing Grace playing on loop. The absence of children is in a way the absence of at least a grace. I doubt the artist would say that he was saying any of that, but Jesus said the stones would cry out. Even Caiaphas was a prophet. I’d say that work resonates because we recognize the law proclamation against us. We can see ourselves in it. The fact that we can’t actually put words to it in a coherent way says just how much vocabulary we have lost – a ghost haunting the exhibit. This passage came up initially before study, but a congregant had an interesting experience/question after our Sunday morning bible study. We started looking at the Psalms and Bonhoeffer’s take on the Psalms as prayer in Thursday morning bible class, but the reactions were interesting enough and the groups different enough that I wanted to see what Sunday morning would do. (That is a hint, if anyone is interested, this is your invitation to come to class on either of those days if you would like to look at the Psalms and prayer. Now back to the point.) The experience was a statement that “the unbeliever is not able to pray”. The question was: in what sense that is true? Bonhoeffer says that natural man left to herself would only pray the 4th petition (give us this day our daily bread). When you think of that in light of what Luther says in the catechism about the 4th petition (God certainly gives daily bread to everyone without our prayers, even to all evil people) and the 1st article of the creed (All this he does out of fatherly, divine goodness and mercy), that is not a big step from saying “the unbeliever is not able to pray”. The only thing they are able to pray for is what the Father provides from His very nature without our prayer. Luther goes on in that 4th petition to say that what we are really asking is that we would recognize God’s providence. That leads to the 1 John passage. What does this mean: a sin that leads to death and one that does not lead to death? Roman Catholic tradition, stemming from the scholastics (I think), talks about mortal and venial sins. It is a gross distortion, but mortal = you are going to hell without repentance and venial = just purgatory. And this would remain one of the big stumbling blocks between a true Protestant and a Catholic. To the protestant all sin is mortal; but we are simultaneously sinners and saints. (See Augsburg Confession Article 2, and Formula of Concord Article 1.) As a confessing Lutheran we can’t actually put that interpretation onto 1 John. What is the situation that John is talking about? Witnessing a sin that does not lead to death. What is that? Well, I would venture any sin except unbelief. Unbelief alone leads to death (John 3:18). If you are praying for the sin of someone, if they believe, that is good and acceptable. Pray that they will see the error of their way and God will give them life. This might actually be a good verse to think about the ELCA or other church bodies that have wandered into grave error. Lord, put them on the right path. We don’t know what that looks like, but that seems to be a valid and Christlike prayer. And it accepts their confession of faith in Jesus Christ. The next part is the tougher part. If one is committing the sin that leads to death (unbelief), John doesn’t say we should pray about that. Do we give up on them? I don’t think that is what he is saying. In the context John is talking about our continued life in Christ. For the fellow believer we pray that God’s mercy would be present. “Lead us not into temptation, but deliver us from the evil one.” For the unbeliever, they are already “blinded and bound in the devil’s kingdom”. The only prayer that is possible is “hallowed be your name, your kingdom come”. That must happen before any mercy for sin. Going from there back to the initial question, can an unbeliever pray? The answer is a squishy no/yes. As Bonhoeffer would say our natural (i.e. our unbelieving) prayers would be just the outpourings of our hearts which would be 4th petition stuff. And we don’t need to pray for that; God is good. What the Holy Spirit would be praying in those circumstances, or Christ as our High Priest, is that that we would recognize the true providence. The other part of that prayer would simply be that God’s kingdom would come to us also. So what I think you would see, if you could “see” the spiritual reality of an unbeliever’s prayer, is Romans 8:26. The unbeliever might have lots of words, none of which would be what they need to pray for. The Holy Spirit would be praying – “your kingdom come” or “help me see your providence”. And the divine response to that prayer might not look anything like what that stream of “OMG, help me” words that they would be conscious of is asking for. Can they pray, yes, but only for what they don’t currently know or believe. On the Christian calendar, this 1st Sunday after Epiphany is given over the Baptism of Jesus by John. We are reading from the Gospel of Luke this year, and Luke’s account is unique. First, the actual baptism is short, just two verses. Second, what captures the attention and imagination is John the Baptist’s phrase – “he will baptize you with the Holy Spirit and with fire”. It seems pretty clear from the text that John was thinking of fire in terms of judgment. And that is a valid scriptural use or allusion of fire. But, there is a second use as well, that of the refiner’s fire. (Mal 3:2) And given Luke’s use of the Spirit and fire in Acts at Pentecost (Acts 2:3), it is that second usage that Jesus’ baptism points toward – a purification that does not consume. Jesus, standing in those Jordan waters, stood with us and for us. He underwent the baptism of the Spirit and fire in the first sense. On the cross Christ received the fire of the wrath at sin for us. As a consequence, when we receive His baptism, we are not consumed but purified. The Spirit is placed within us which then kindles our hearts with faith and reforms our wills to follow the will of God best expressed in His law. Jesus’ baptism, Christian baptism, is full of power. Now our adversary will try his best to deny that and get us to think it not so, but this is the thing about baptism. It is a promise of God – Father, Son and Spirit – all present at Jesus’ baptism where he set out on this course of standing for us. God’s promises are true. We just need to grab them with faith. The same faith that is kindled by the Spirit. It might not be an exciting emotional experience. We might not even remember it. But baptism is God’s promise. Our faith rests not our anything in us, but on what God is pleased with. God is please with His son, who underwent and commanded baptism.